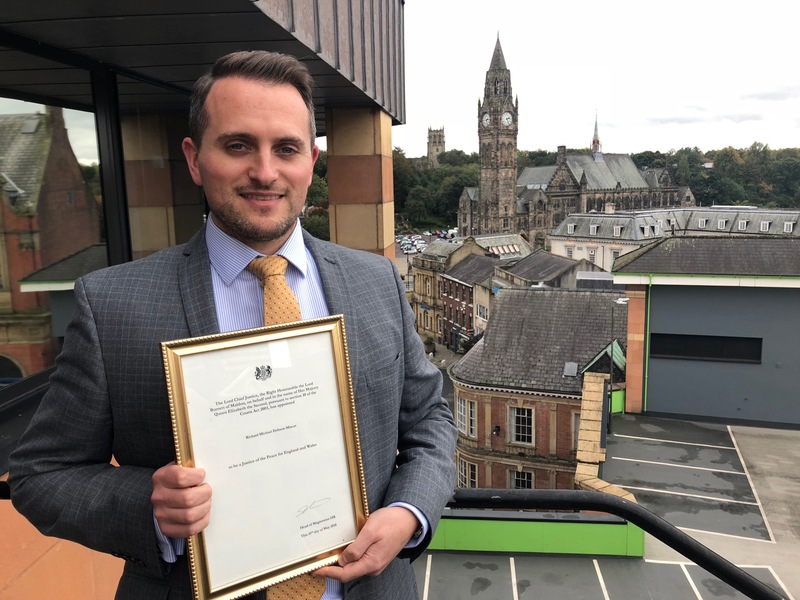 Richard Dobson-Mason, a local from Rochdale was sworn in as a Justice of the Peace on Friday 21st September 2018 at the Manchester Civil and Family Justice Centre. This is a landmark feat, as due to the extensive application process, only thirty percent of hopefuls become Magistrates. This mean big things for Richard, who has spent his adulthood devoted to studying and practicing law. Richard Dobson-Mason originally applied for the position in May 2017 and was appointed the following year in May 2018, with the swearing-in ceremony taking place this September. In total, there were 27 individuals who were being honoured with the title Justice of the Peace that day, including Richard. The process to become a Magistrate is a long one, which includes a number of interviews, tests and court visits. However, Richard will still have to wait to sit as a Justice of the Peace until he completes further training and court viewings, which he hopes to complete by the end of the year. A Justice of the Peace is a Magistrate who can act as a Judge in a local court of criminal law. There are six things that are taken into consideration for those who are applying: character, communication, social awareness, maturity and temperament, sound judgment and finally, commitment and reliability – all of which Richard Dobson-Mason encompasses. Most criminal cases begin in the Magistrate’s Court, and around ninety percent are completed there. As a Justice of the Peace, Richard will be dealing with trails, pleas, bails and related restrictions as well as sentencing, amongst other things. Richard Dobson-Mason will sit a minimum of thirteen full days (or twenty-six half days) per year, and will be working at either Manchester and Salford Magistrates’ Court, or Tameside Magistrates’ Court.